The 2019 best heat pumps include single-stage, two-stage and variable-capacity (modulating) models, so you have performance choices from top brands. These units make our list because they have a proven track record of lower mechanical failure than most heat pumps. They are durable and offer good efficiency and performance too. If you’re looking for the most efficient 2019 heat pumps, we’ve prepared a complete guide on them. These are the most basic and affordable units. And they cost less to repair, if required. Single-stage heat pumps run at full capacity when on, so might cause slight temperature fluctuations. That’s the good and bad of a single-stage vs two-stage or modulating heat pump. Note on efficiency ratings: SEER and EER are cooling ratings. HSPF is a heating rating. The higher the numbers, the less energy the unit uses (it is more energy-efficient). This is Bryant’s best single stage heat pump. It is available in an identical Carrier version, if you have a Carrier installer you trust and want to install your next AC. The Bryant 285B is quiet at 68 decibels, quieter than most single-stage models. It is wi-fi enabled too, so you can use the Bryant app, your smart device and a Bryant Evolution Connex thermostat to complete the system if you want remote connectivity. Efficiency: Up to 16 SEER, 13 EER and 8.5 HSPF. Energy Star rated. Features: Wi-fi remote access, 68 decibel quiet operation, single-stage heating and cooling, dual fuel – which means the unit can be installed in a split system with a gas furnace. A dual fuel system is used in very cold climates where temperatures well below freezing make a heat pump inefficient. The system will heat with the gas furnace until temperatures warm up. Pros: Affordable, Energy Star, dual fuel and very durable. Repairs are less common and cheaper. Cons: Single-stage operation might cause slight temperature fluctuations. Best suited to: Mild to warm climates. Ruud and Rheem are Pomona Industries brands, and their heat pump lineup is identical. This heat pump is called the Ruud Achiever Series RP15 heat pump. While these brands don’t get the marketing budget that Trane, Carrier and Lennox have, their products are nearly or clearly as good. Features: Single-stage Copeland compressor, composite base pan that reduces vibration noise. Louvered panels for better coil protection. Warranty: 10 years on all parts, the average for the industry. Pros: Lower cost and good quality. Cons: Single-stage heating and cooling doesn’t deliver the same level of dehumidification and indoor climate comfort. Best suited to: Mild and warm climates. This unit is also popular in part-time locations like guest apartments, workshops and vacation homes. This unit has a micro channel coil that more quickly disperses heat in summer and gathers it in winter. That means the unit works more quickly than heat pumps with standard coils. Micro channel coils from Johnson Controls (York, Coleman and Luxaire) have had leaking issues, but Nortek Global coils are well built. The reliability of this Maytag heat pump is very good. The MSH1BE heat pump is available in identical models from Broan, Nu-Tone and other Nortek Global brands, known as NORDYNE until recently. Efficiency: Up to 15 SEER, 12.5 EER and 8.5 HSPF, Energy Star rated. Features: Aluminum coil for improved resistance to corrosion, single-stage heating/cooling. Warranty: 12-year parts warranty is longer than the average of 10 years. Maytag heat pumps come with a 1-year heat pump replacement guarantee if the compressor fails in the first year. This is mostly a marketing gimmick, since compressors rarely fail in the first 10 years. Pros: Affordability, reliability and a good warranty. Cons: It’s a single-stage model, so temperature swings might be noticeable. Best suited to: Moderate and cool climates plus anywhere a heat pump is used for occasional heating and/or cooling. Some consumers are wary of Goodman HVAC products because of how affordable (cheap) they are. But there are two things to consider before you reject Goodman. First, Goodman was bought by global HVAC leader Daikin in 2012, and the entire product lineup has been infused with quality since that time. Secondly, this Goodman heat pump is Energy Star rated and is backed by a better warranty than you would get with a comparable Lennox heat pump. The Goodman GSZ16 heat pump is dependable and quite efficient. Efficiency: Up to 16 SEER, 13.0 EER and 9.0 HSPF, Energy Star. Pros: Low cost and reliable. Cons: Single-stage compressors don’t deliver optimal indoor climate control. Best suited to: Warm climates where cooling is more important than heating and mild climates that don’t require heavy heating or air conditioning. These units cost $400-$1,000 more than single-stage models depending on the brand, series and size of the heat pump. What you get for the money is efficiency that is 10% to 15% better plus improved climate control in two ways: Temperatures that are more balanced and increased dehumidification. Since the units run on low (about 65% of capacity) most of the time, they are also quieter. Trane is one of the best-known brands, in part due to its huge marketing budget. But the units also rate among the best for reliability. They, and sister brand American Standard, break down less than average. 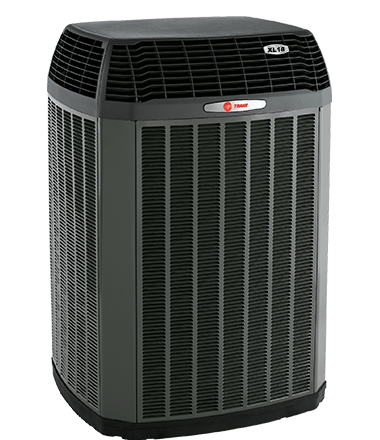 The Trane XL18i was released almost ten years ago, so there’s good data to show that it is a reliable heat pump. As with any two-stage unit, you’ll get best results when you pair it with a variable-speed air handler. Features: 2-stage compressor, louvered sides protect the coil better than wire cage types, spine fin coils designed to quickly disperse heat. Best suited to: Warm to hot climates with average to high humidity. This is the most efficient two-stage heat pump on the market, demonstrating Lennox’s success in producing units with the highest energy efficiency on the market. It’s one of just a few 2-stage models on the 2019 Energy Star Most Efficient heat pump list. Features: Two-stage compressor, smart defrost, louvered jacket, works with Lennox wi-fi thermostat and smart system. Pros: Excellent efficiency, good climate control. Cons: Much higher cost than some two-stage models. Lennox repair parts also sometimes cost more than standard parts. Best suited to: Very warm and hot climates and those with high humidity. This two-stage Day & Night heat pump is a very good value. It uses many of the same parts that premium heat pump brand Carrier uses. Both brands, along with Bryant, Heil and others are owned/built by United Technologies Corporation (UTX). Day & Night is a value brand, often priced well below Carrier and Bryant for essentially the same equipment. Features: Two stages of heating and air conditioning, wi-fi, dual fuel capable. Warranty: 10 years on all parts plus a 10-year replacement warranty. The entire unit will be replaced if the coil or compressor fails in the first decade. Pros: Good efficiency and indoor comfort. Excellent warranty and value. Cons: Very little negative about this unit. Best suited to: Warm to hot climates. Handles humidity well too. Since it is dual fuel capable, it can be installed as part of a split system with a gas or oil furnace. In 2012, Daikin Global bought Goodman/Amana to get a foot in the US residential HVAC market. Originally, Daikin simply put a Daikin label on Goodman products. Since that time, Daikin has been improving the quality and reliability of the product lineup including heat pumps. It makes the 2019 Energy Star Most Efficient list. The heating efficiency is better than the Lennox XP21. This is a solid performer that should deliver 15-20 years of service when maintained. Features: 2 stage heating and AC, quality Copeland compressor and diagnostics, wi-fi ready. Warranty: 12 years on all parts. Pros: Excellent efficiency, climate control and quality. Good warranty. Cons: With quality and efficiency comes a higher cost. Best suited to: Warm and hot climates with moderate to high humidity. Variable capacity, or modulating, means that the compressor can run at any speed or capacity from about 40% to 100%. They’re designed to run at the lowest capacity required to meet the thermostat demand for heat or AC. This allows for the best efficiency and humidity control, and it is quieter than a unit running at 70% or 100% most of the time. These two variable-capacity heat pumps stand out. Carrier released the Infinity 20 25VNAO with Greenspeed Intelligence about a decade ago. It one the first available and has proven to be a reliable heat pump. Features: Variable speed compressor, compressor sound blanket and muffler for sound as low as 58db, dual fuel capable. Pros: Best-in-class efficiency and climate control. Quiet operation. Cons: High cost for the heat pump and compressor, if it needs replacing. Best suited to: Hot climates where the AC is used from Spring into Autumn, especially those with high humidity. Can also be used in cold climates when installed in a system with a gas furnace. The Trane VX18 is a newer generation variable-speed heat pump than the Carrier 25VNAO. That means it doesn’t have the reliability track record of the Carrier model, but in its five years on the market, it has been a sound performer. Its compressor modulates in increments of about 1/10 of 1%, so climate control is the most precise available. This unit is available in an American Standard version too, as both brands are owned/built by Ingersoll-Rand. Warranty: 12 years on the compressor. 10 years on all other parts. Pros: Excellent efficiency and climate control. Trane has one of the better dependability ratings in the industry. Cons: Equipment and repairs are costlier for a variable-speed unit than for single-stage and two-stage models. Best suited to: Warm to hot climates with heavy demand for air conditioning. Start with climate. The warmer and more humid your climate is, the higher the efficiency should be to balance upfront costs with ongoing energy costs. If you live in a climate with both summer and winter extremes, then one of the dual fuel models paired with a gas furnace will give you the lowest annual heating and air conditioning costs. In those climates, the heat pump does the heating when temperatures are above freezing. Below freezing, a heat pump becomes less effective, so the gas furnace kicks in to heat until temperatures rise. Finally, get several estimates for the heat pump and installation. Choose a contractor with a record of reliability and good workmanship. If you’d like no-obligation quotes from some of the top installers in your area, use our Free Estimate partner. There is no cost to you. The contractors in the service are prescreened for experience and quality work. Great list. Still leaning on others since my blog https://www.localair.com is still under construction. Thank you for providing excellent content to consumers and contractors.